After six years on the ballot, Mike Mussina has been elected into the National Baseball Hall of Fame with 76.7 percent of the vote, joining unanimous selection Mariano Rivera, along with Edgar Martinez and Roy Halladay. Mussina, 50, spent eight seasons in the Bronx after a 10-year stint with the Orioles, and finished his career with five All-Star nods, seven Gold Glove Awards and 270 victories. Moose received Cy Young votes in nine separate seasons, and though he never won the coveted award, his consistency and durability pitching in the toughest division in baseball during the height of the Steroid Era earned him widespread respect. With pinpoint control and a diverse array of pitches in his arsenal, the former first-round draft pick piled up victories at a furious clip. 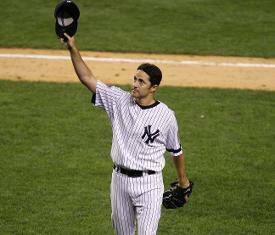 In the final start of his final season, Mussina reached the 20-win plateau for the first time in his career, checking off a major milestone along his Hall of Fame journey. A model of durability, Mussina eclipsed 197 innings pitched in 12 of his 18 seasons in the Majors, while maintaining a career ERA of 3.68 over 537 appearances. Mussina wouldn't reveal which team hat he planned on wearing on his Cooperstown bust, but after an unforgettable career in the AL East over the span of nearly two decades, his Hall of Fame nod is well-deserved.